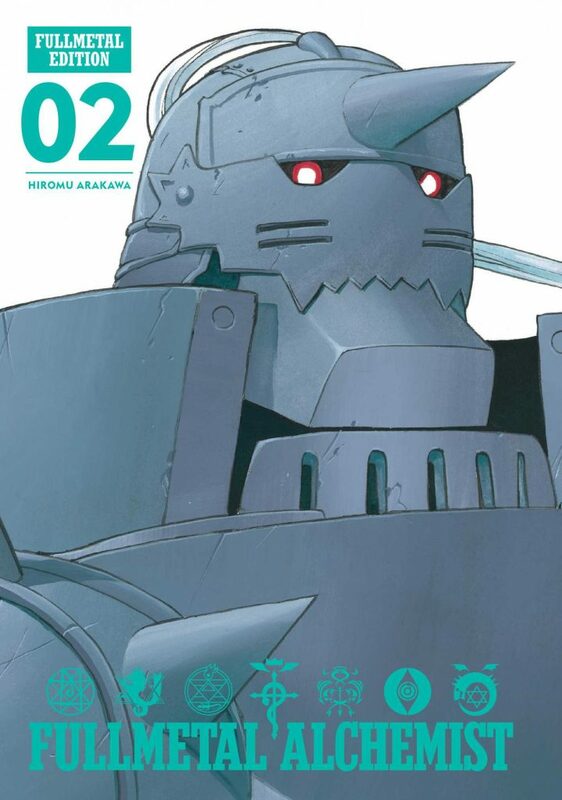 Four months have passed since I began my Fullmetal Alchemist catch-up with the Fullmetal Edition re-release, and now the second hardcover — a collection of Volume 2’s latter half and Volume 3’s entirety — lies in my hands. Finally, I learn how Ed and Al escape from Scar, dig deeper into the brothers’ past, meet Winry Rockbell, and engage in more conspiracies and secret plots than you can shake a stick at. 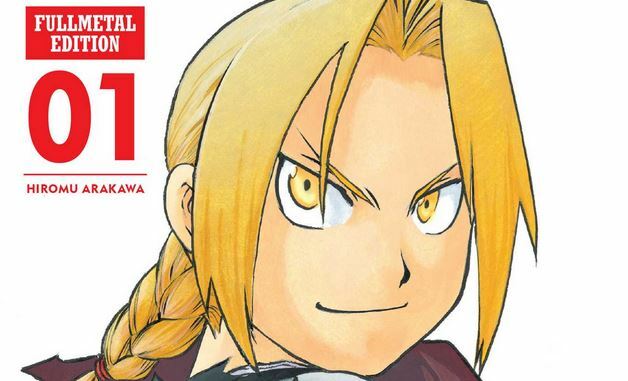 Yes, believe it or not, I’m only just reading Hiromu Arakawa’s Fullmetal Alchemist for the first time, but already I regret not following its 2004 Adult Swim debut — while I suspect I’ll ultimately prefer Silver Spoon and its hard-hitting, relatable realism, Fullmetal Alchemist is an undeniable classic. In the previous volume, I hailed the drama as Fullmetal Alchemist’s high-point; here, that still stands, but I’m growing ever-more attached to its comedy, and that’s how Alex Louis Armstrong – one of Ed and Al’s fellow State Alchemists — absolutely steals the show. Only briefly glimpsed in the first volume, this bald, mustachioed mountain of muscle quickly grows on us in his bouts of tears and proneness in shedding clothes (the latter which we witness as an effective interrogation technique). 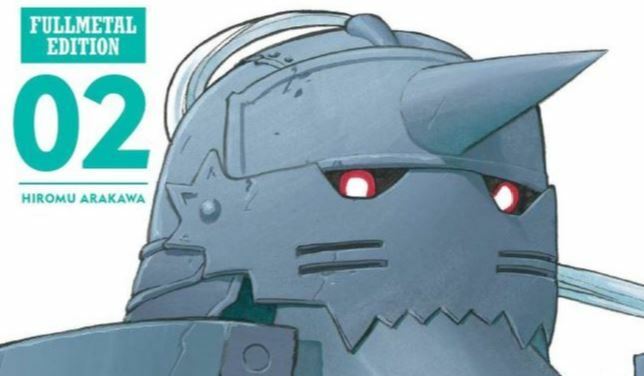 Of course, said muscle renders him a beast in battle, but while the dichotomy between strength and goofiness is hardly rare within shonen, it’s successful framing within such gems like Fullmetal Alchemist that allow both depth and further reader engagement in hypothesizing — for instance, could Armstrong’s teddy bear-personality and philosophy of “We must tear down into order to build” function as repentance for his dark connections to the Isvhalans? Perhaps he was always that way, but that I even ask such questions proves it has my attention. With other tantalizing mysteries — such as Scar, last volume’s serial killer, using alchemy in spite of his drive to murder state alchemists — the rabbit hole grows ever deeper and yet again raises questions of morality. The state alchemists we’ve met are certainly not terrible people in themselves, but their involvement in the Ishvalan Civil War renders them not entirely innocent, either; in fact, with the terrible secret behind the Philosopher’s Stone unearthed, who’s to say they’re all friendly? Evidence of corruption, the mental torture of Dr. Marcoh, and the encounter of villains echoing Al’s condition do not paint a very pleasant picture, and it’s enough to put down anybody, not least of all our world-weary heroes. So much expression for a soul-bound suit of armor. It’s why intermittent lulls like the return to Resembool are necessary breathers – Ed and Al’s repair trip to their childhood home leads them to the Rockbell family, old acquaintances skilled with mechanics. There’s no hidden schemes or crooked alchemists fouling up the joint, and while some raw memories surface through Granny Pinako’s monologue, this entire outing serves as a reminder for the brothers’ desire to live a normal life, right down to Ed’s vigil over the charred remains of his home (I say this despite his claims complaints of boredom, but perhaps that’s just projection?). It’s here we also get a knack for Arakawa’s visual storytelling, as we witness the family dog, Den, ambling about with an automail leg (what made him lose his leg? Is it relevant at all to the storyline? Who cares — it’s fun to speculate). Perhaps we can think of the wide, open countryside as hinting towards Arakawa’s slice-of-life future…? Naturally, being a shonen, we get more of Fullmetal Alchemist’s taste for action sequences, which just so happen to bookend the volume. Arakawa surely has a penchant for brawling — alchemy’s innate sorcery allows for some flashy attacks, and Al’s fight with Barry, or should I say Number 66, isn’t afraid to get bloody — yet if I must point out any weak link, these fights feel more peripheral than the actual drama. Again, they’re not without their strengths; if anything, said drama carefully bleeds into the fight sequences when necessary (check out the backstory for Barry, wherein Arakawa uses a deviant artstyle), but that just further proves the aforementioned conspiracies and moralities are truly the heart of Fullmetal Alchemist. Still, it’s sensible these battles never last very long — unlike other shonen heroes, Ed and Al don’t strive for fame or empowerment, but merely self-preservation. Alas, we again leave off with another cliffhanger — this time just as a vital clue’s about to drop, even! Unlike last volume, though, it’s hardly telegraphed what’ll happen, and with my own limited knowledge only going so far, I have no idea whether everything will be okay. But with the series’ stakes, cast and themes gradually coming together, one’s thing’s for sure: I already can’t wait for the next volume.